The Daily Herald is endorsing candidates on the Kane County Board this week and one of the endorsements stands out: that of District 19 Board Member Kurk Kojzarek. Kurt has been working hard for close to a decade to make a difference in his community and has had an impact on the Kane County Board. The Kane County Board District 19 race is a rematch from two years ago between Republican incumbent Kurt Kojzarek and Democrat Hidayat Khan, who is even more absent from the race than he was two years ago when he also shunned all the Daily Herald's attempts to question him on the issues. It seems a stretch to think he would be answerable to residents if elected to office. Kojzarek has proved to be a calming, moderate voice on the board the last two years. He says the board is moving in a positive direction and functioning better. 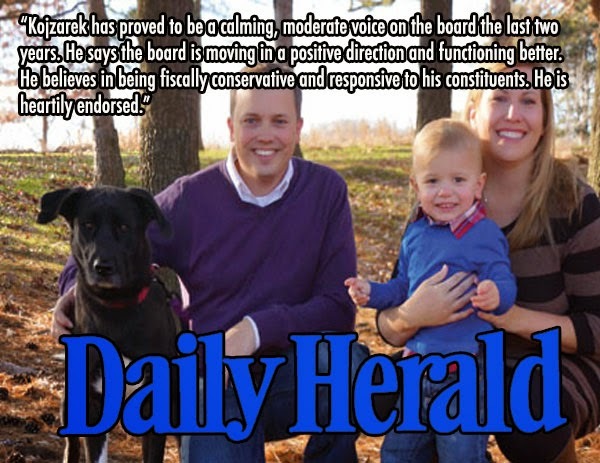 He believes in being fiscally conservative and responsive to his constituents. He is heartily endorsed. You can get involved with Kurt's campaign by visiting his site here.